comfortable seating.Built in to the book case is a flat screen tv with all the cable channels, dvd and dvr. We supply free secure wifi. The full size formal dining room has nice antique furnishings. The kitchen is quite large and has the original walk in and pass through pantry, again many antiques in this room as well.The kitchen has a comfortable day bed as well.Off the kitchen is a great screened in sun porch with many comfortable places to rest. The entire floor features new decor and paint. The yard off the porch is there to enjoy and we have a propane BBQ for your use. We provide one on site parking spot.Please contact us about our cancellation policy. Full Kitchen with all needed equipment to make great meals. The house has a wonderful yard with a large Chestnut tree,m providing shade, many chairs to relax in. The Bed room has a window a/c unit and the living room has a large a/c unit, the sun porch is screened and has ceiling fan, kitchen has floor fans. Cozy and lovely home. Would definitely stay again. Great location. Great outdoor space. Bed was very comfortable. Kitchen well equipped. Great attention to detail. Luanne was very nice and helpful. Loved this little gem. Perfect location, spacious, and comfortable. Large kitchen and dining room, large enough for a family, great size screened in deck with lots of couches and chairs as a well as an outside backyard, large living room with bed in couch, and large bedroom. Odd small room behind the bedroom that was cool, but overall huge space, good internet, even had lots of tv channels to relax to. Location is right next to downtown and beach but yet still very quiet and peaceful, also had a good size parking space so overall just was perfect and convenient in all ways. Simply put.. It delivered on all levels. 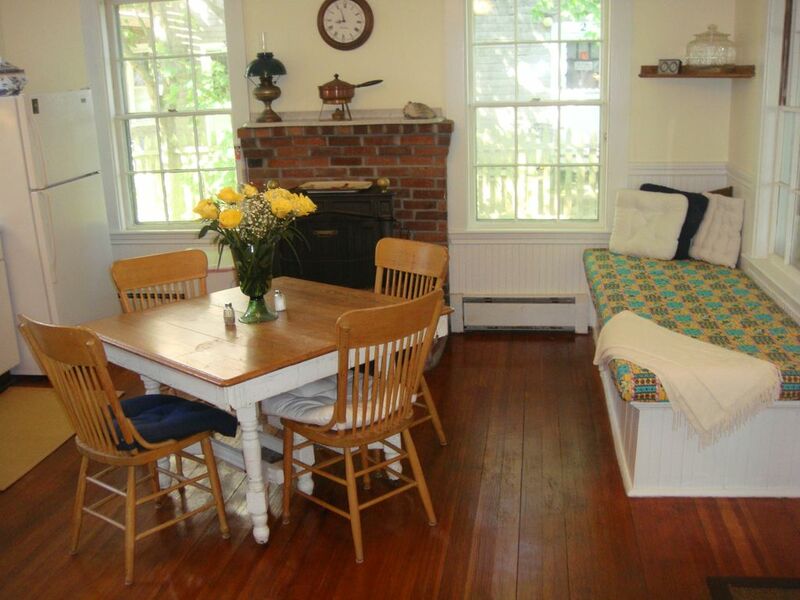 Fantastic location, charming, historical New England home- has everything you need..Loved it, will be returning. Here for Holly Folly weekend. Always such a Warm cozy place to stay. That is why we always come back. Great location and close to everything. We will be coming back soon! Provincetown is located at the very tip of Cape Cod and enjoys cool breezes from the surrounding water making it much more comfortable than the main land in the summer months. The light in this area is spectacular and is one of the main reasons artists have called this home for over two hundred years. Come and see for yourself.